Do traveling, discovering different places and interacting with different cultures give you goosebumps of the good kind? Have you ever imagined yourself hopping from country to country, having the time of your life and earning from it at the same time? If you’re a seasoned traveler, taking photographs and writing about your journeys won’t feel like work at all because you’re pursuing your passion and immensely enjoying it. 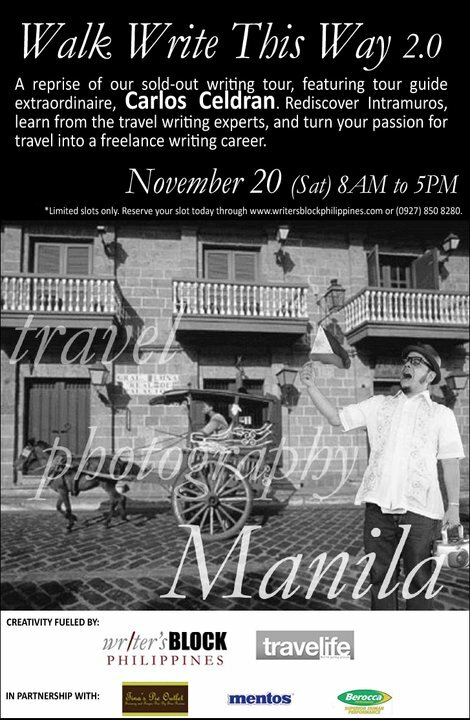 If you want to know the basics of travel writing and learn about the opportunities you can explore, Writer’s Block Philippines invites you to Walk Write This Way 2.0, a travel writing workshop featuring Manila tourist guide Carlos Celdran. The workshop will be held on November 20, Saturday from 8am-5pm. Workshop participants will start the morning with the Carlos Celdran “If these walls could talk” walking tour of Intramuros and then be given free time to write about their experience. Later, these writing pieces will be discussed with Writer’s Block Philippines founders and guest editors fromTravelife Magazine, who will talk about what editors look for and share what really makes a good travel piece. Workshop fee is P3,000. Members of Writer’s Block Philippines get 10% off the workshop fee (pay only P2,700). Slots are limited, so register NOW at the WRITER’S BLOCK website.